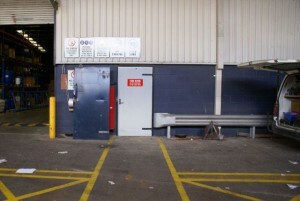 Commercial doors, fire doors and factory exit doors are our specialty. With over 35 years of experience, our team of locksmiths and carpenters work only to the highest degree of standards. 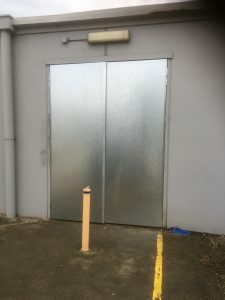 We offer a wide range of door services including basic internal office doors, to solid core metal clad doors and fire doors, all of which are available in a number of locations. That includes Melbourne (and surrounding suburb’s), Regional Victoria, Geelong and more. 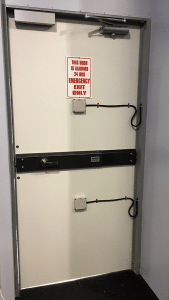 We’re able to repair and replace broken doors at your home or office and can upgrade existing business and factory exit and fire doors to make them OH&S compliant. We also install Fire Rated Metal Clad Doors, Solid Core Metal Clad Doors and Steel Pressed Door Jambs to add security to factories. The photo on the right shows a set of double doors for a retail customer that had been broken in to. 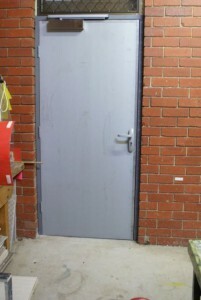 We replaced the existing broken timber doors with Solid Core Metal Clad Doors. We and also fit a Rivers four point semaphore lock. There is a bolt that locks into the door head and the ground. It also has two locking bars that tie the door leaves together, by engaging into receiving cups attached to the passive door leaf. 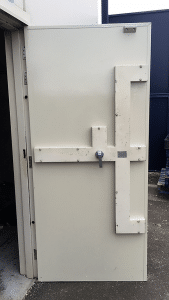 This Rivers lock is a great way to lock double doors in high security situations and comply with OH&S regulations. The heavy, steel door on the right is one we replaced after the existing timber door fell apart after an attempted break in. We replaced it with a Solid Core Metal Clad Door finished in Color bond and re-fit the existing four point Rivers lock (which is one of the best security options and complies to OH&S regulations). The exit door on the left is one we replaced in a retail store. The existing door was made of glass and was destroyed after a break in. We installed a Solid Core Metal Clad Door finished in Color bond and fit a new Model D Two Point Rivers locking bar. This lock is a great option for commercial exit doors requiring high security and complies to exit door regulations. At LDC locksmiths we have a dedicated team of trained, full time staff with a wealth of experience under their belts. However, we believe education is an ongoing experience and are committed to providing our staff with training all year round. This ensures we keep up with emerging regulations and information on fire doors and safety.